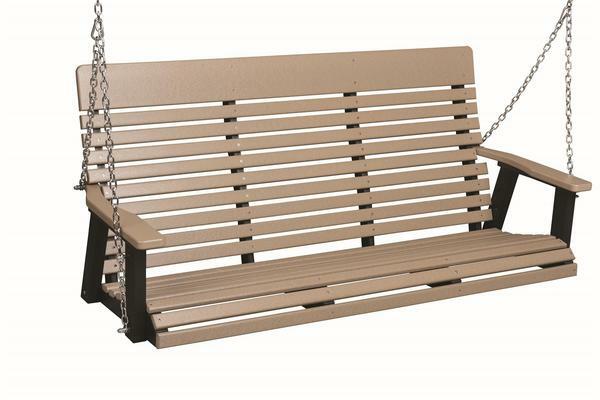 Perfect for relaxing and spending long afternoons with someone special, our Berlin Gardens Poly Casual-Back Porch Swing is a great addition to any outdoor decor! Handcrafted with a beautifully contoured back and seat, this swing will allow for hours of continued enjoyment and comfort. With the optional Sunbrella seat cushions and throw pillows, you may never want to leave your swing again. Each swing is handcrafted from eco-friendly poly lumber, which is derived from recycled milk jugs, resulting in a material that holds uniform color and requires little to no maintenance, even when constantly exposed to the elements. Your poly lumber porch swing will not fade, chip, crack, rot, warp or develop mold and mildew like traditional wooden outdoor furniture. Ensure your investment in outdoor furniture with our Berlin Gardens Collection and a 20 year warranty for residential use.